Fluid 100 Professional Watercolor Paper Sheets, Blocks & Pochettes - Made by European Mill Masters who Combine Traditional Papermaking Techniques with Modern Technology! Fluid 100 Watercolor Paper is made using traditional paper milling techniques used by the old European masters coupled with modern technology to create a fine watercolor paper that is 100% cotton. Fluid 100 Watercolor paper is natural white and is available in 140lb/300lb in both hot pressed and cold pressed surfaces and in sheets, blocks, rolls and pochettes. Each sheet of paper, block, roll or pochette is strong with a subtle and pleasing surface texture that is acid free and archival. Gelatin sizing gives the artist brilliant color and increased control that is perfect for use with both wet and dry media. Each block has 15 sheets glued on two edges. 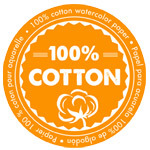 Fluid 100 Watercolor Paper is made using traditional paper milling techniques used by the old European masters coupled with modern technology to create a fine watercolor paper that is 100% cotton. Fluid 100 Watercolor paper is natural white and is available in 140lb/300lb in both hot pressed and cold pressed surfaces and in sheets, blocks, rolls and pochettes. Each sheet of paper, block, roll or pochette is strong with a subtle and pleasing surface texture that is acid free and archival. Gelatin sizing gives the artist brilliant color and increased control that is perfect for use with both wet and dry media. Fluid and Fluid 100 blocks are taped on just two sides, which makes it much easier to remove the top sheet without damaging the sheets below - thus the name: “Easy-blocks”! Each watercolor block has 15 sheets glued on two edges. Each watercolor pochette has 10 sheets. Fluid 100 blocks are taped on just two sides, which makes it much easier to remove the top sheet without damaging the sheets below - thus the name: “Easy-blocks”! What is a Pochette? How does it differ from individual sheets? Would be nice if it were explained in the discription. Thank you for contacting us. The word Pochette is a French word for pocket or envelope. Essentially it is a fancy way to say that a number of loose sheets of paper are contained in a paper pocket or envelope. Thank you for sharing feedback with us about this product page and the copy description. We do appreciate your advise and business. Please let us know if you have any other questions or concerns.